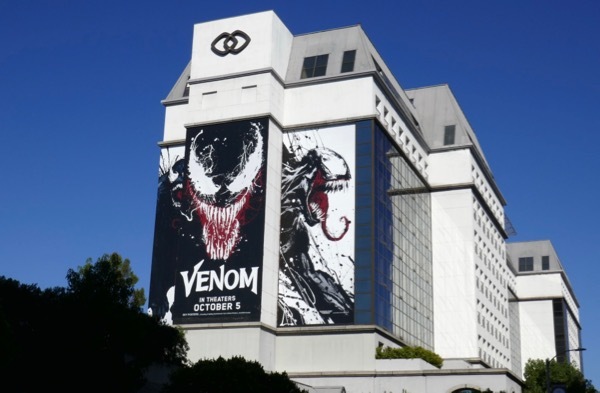 The world may indeed have enough superheroes at the moment, but that's not to say there's not more comic book stories to entertain people on the big screen, case in point Venom. 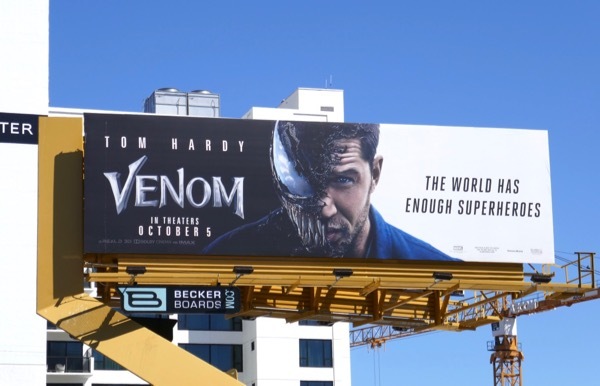 In the movie Tom Hardy stars as the scandal-ridden journalist 'Eddie Brock' who is investigating the Life Foundation when he becomes bonded with an alien symbiote which gives him amazing superpowers and a deadly alter-ego, 'Venom'. The anti-hero character started life as a black and white alien costume that Spider-man discovered during Marvel's 1984 comic book series Secrets Wars, but when it started bringing out his aggressive tendencies he discovered the suit was alive and he rejected it. 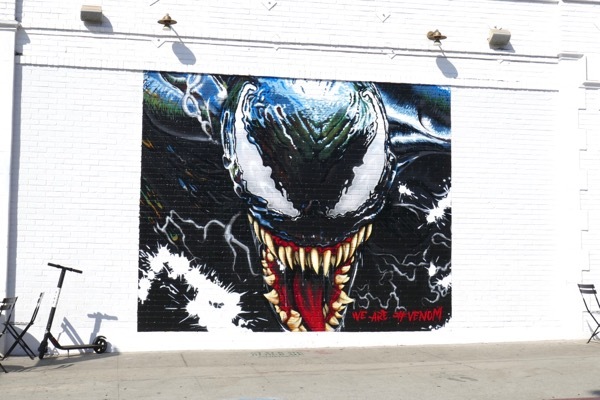 The alien then bonded with Eddie Brock and transformed into the monstrous creature with sharp teeth and long, slithering tongue that fans know and love. 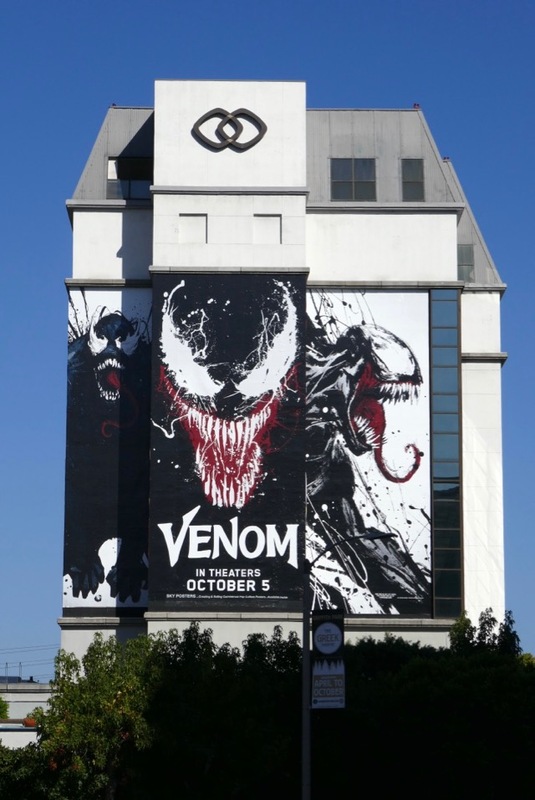 This isn't Venom's first live-action appearance on the big screen as he appeared as a villain in 2007's Spider-man 3 played by Topher Grace. 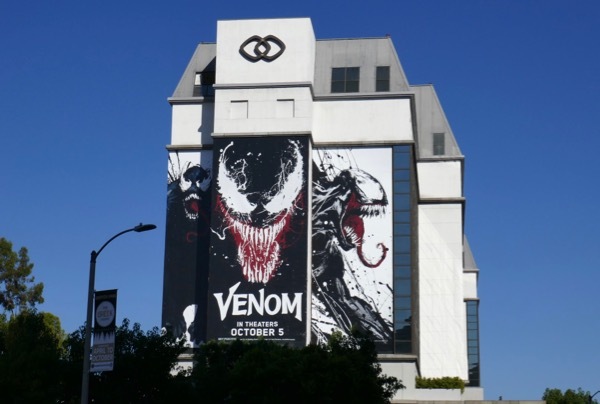 In this reboot of Spidey's arch-nemesis, Venom isn't the only shape-changing symbiote we'll get to meet as it looks like the Life Foundation had been busy with their experiments. 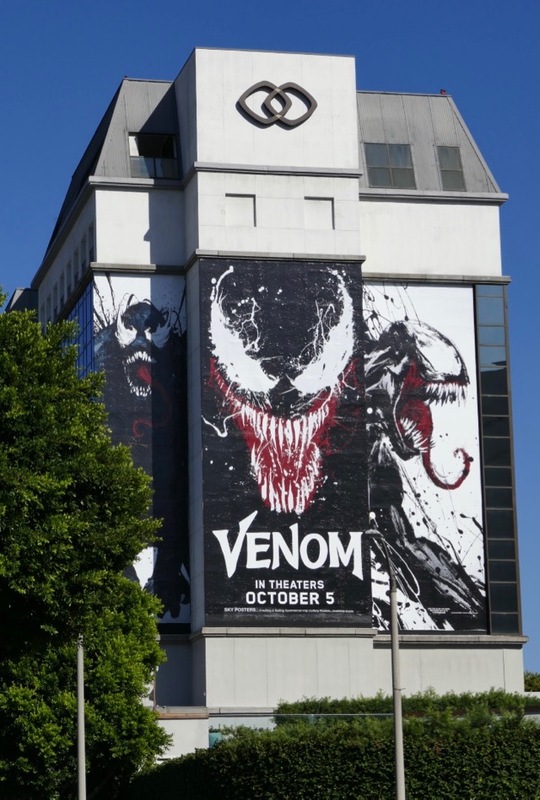 These movie billboards and wall mural ads, which lean heavily into Venom's comic book look, were snapped along Sunset Boulevard, Melrose Avenue, La Brea Avenue and Beverly Boulevard from September 15 to September 29, 2018. 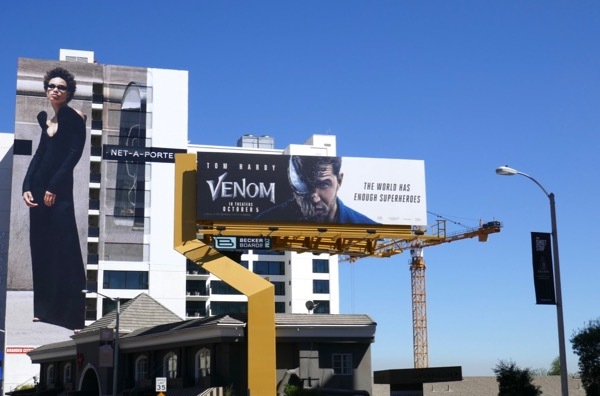 For more from the Spiderverse be sure to check out all these Spider-man movie billboards from recent years. 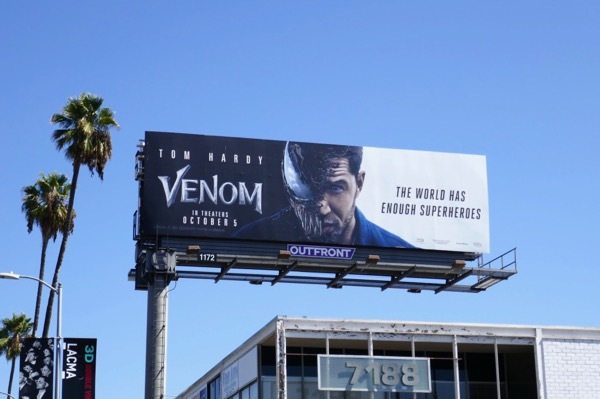 Plus fans of the actor can enjoy all these Tom Hardy movie and TV billboards, like Taboo, Dunkirk, Mad Max: Fury Road and The Dark Knight Rises. 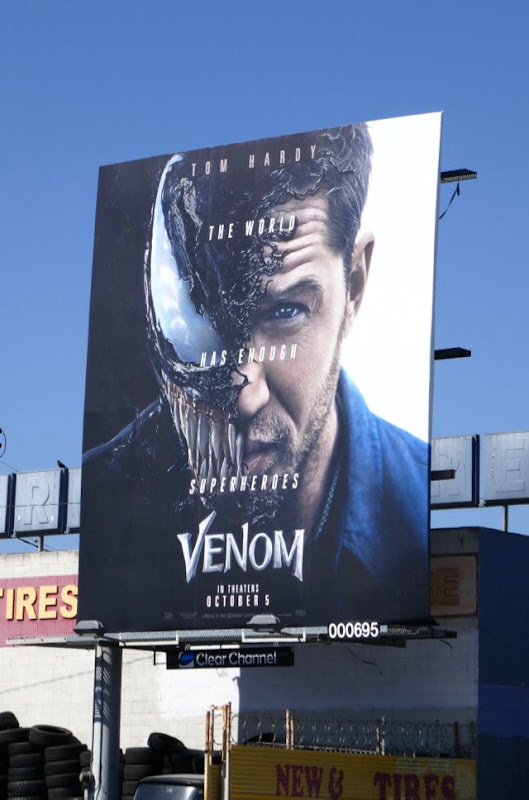 In a movie and television landscape filled with Marvel and DC Comics characters, Venom looks like it wants to offer some different, some a bit more horrifying than your usual superheroics, let's see if it can succeed in the same way the R-Rated Deadpool did.